Will Melbourne’s Apartment Construction Boom Continue? By all accounts, the apartment construction boom in Melbourne has been monumental. The numbers tell the story. Throughout Victoria, ground broke on more multi-unit dwellings in the five years spanning 2010-2014 (111,574) than in the entire decade prior to that (104,032). Annual start numbers on units and apartments have broken all-time records during three of the past five years. Commencements were higher last year compared with any other year on record by a long shot. Furthermore, the good news keeps rolling in. In the past six months alone, construction has been approved on more multi-residential dwellings than were typically issued throughout the course of entire years prior to the start of the boom, and more permits have been issued for units and apartments in the first four months of this year than were issued in the entire year during the depths of the GFC crisis in 2008. Around 1,958 new apartments will be built in seven multi-residential towers as part of the new Fisherman’s Bend precinct, State Planning Minister Richard Wynn has announced. Last month, Melbourne City Council gave the tick of approval for twin towers of 23 and 29 stories respectively at 889 Collins Street at Docklands. Indeed, this year, ground should break on around 24,400 new houses and apartments, according to Housing Industry Association – down seven per cent on last year’s all time high but still the second highest year on record. A number of factors are driving this. First and most obviously, the low interest rate environment is encouraging a strong push toward domestic investment in real-estate, a phenomenon underscored by record high levels of housing finance commitments being taken out throughout Melbourne and Victoria. Foreign money pouring in has also helped. In 2013/14, for example, non-residents gained approval to purchase more than 6,000 new houses or lots of vacant land, according to Foreign Investment Review Board figures – up from less than 2,000 as recently as 2009/10. This means that while foreign influence in the market for existing housing is less significant, non-residents now make up now account for more than one in 10 purchases of new or newly constructed dwellings throughout the state, and probably a much greater proportion than that in the inner Melbourne high-rise market specifically where foreign buyer activity is typically concentrated. More recently, participants in the most recent Property Council survey indicated that non-residents may have accounted for as many as three in 10 developer residential property sales in the first three months of this year. Prior to the state election last November, meanwhile, an apparent desire on the part of then-Planning Minister Matthew Guy to tick off high rises left, right and centre no doubt also played a part. All this is placing considerable pressure on the availability of trades. Quantity surveying outfit WT Partnership, for example, reports limited availability in areas such as concrete, façade and joinery, while weak currency is placing upward pressure on the cost of imported materials for major building elements such as facades, vertical transportation, mass produced joinery, specialist mechanical and electrical equipment and lighting. Furthermore, negatives are starting to emerge. Complaints about bad apartment design and cramped layouts are growing louder, as are grumbles about the new concrete jungle creating wind and overshadowing problems. Earlier this year, City of Melbourne Councillor Richard Foster acknowledged the city had gone ‘way too far’ in approving high rises without adequately considering the amenity of people below. This may affect the appetite of the new state government to approve new projects. A proposal for a 43-level tower on Spring Street was knocked back in April, while the government is looking to introduce minimum apartment size requirements next year. Moreover, fears are starting to emerge about oversupply, a phenomenon which will no doubt eventually prompt developers to think twice about new projects. BIS Shrapnel’s Frank Gelber, for example, reckons the city’s apartment market will face an excess of around 15,000 dwellings in around two years’ time. Finally, recent events at Docklands not only demonstrate the potential consequences of shoddy building products but hardly promote further enthusiasm for high rise living. 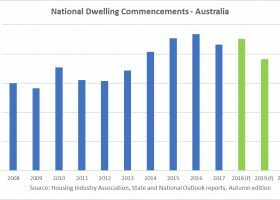 While the HIA expects ground will break an a whopping 24,400 houses and apartments this year, it reckons commencements will drop back to around around 16,000 to 17,000 thereafter – well down from current levels but still well above levels experienced prior to the current boom. The peak of Melbourne’s apartment building craze might be about to pass, but activity looks set to remain at historically healthy levels for some time yet. Shoddy apartments are definitely an issue in Melbourne – those guidelines are urgently needed.